I am proud to present first version of Chrome Extension for SAP ABAP Help Blog. This extension is also the first one SAP space. 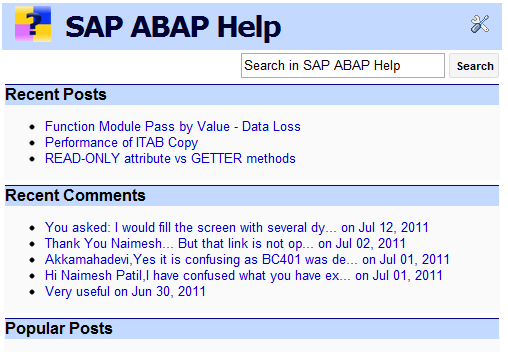 SAP ABAP Help extension is now available in the Chrome Web Store. This extension allow you to stay tuned with the Blog content – Both Post and Comments. If you are not yet using Chrome browser, you can install it by visiting Chrome Download page. After you install the extension, you would see this icon in the Chrome browser. By clicking this icon, you will observe a popup with the latest post, latest comment and popular posts. You can configure the number of posts, displaying author & post date as well as the Summary for the post. Similar type of settings are also available for comments section. Settings can be accessed using this option. Let me know if you face any issues while using the extension. Get in touch with me if you wish to know, how this works or want to develop one for your site/blog.